Purchased at the CVS Pharmacy in Philipsburg, PA. I remember that my old hairdryer died and I needed a new one, like THAT day. I had the day off from school (my 6th semester I believe). So that would've made it a Tuesday or Thursday. 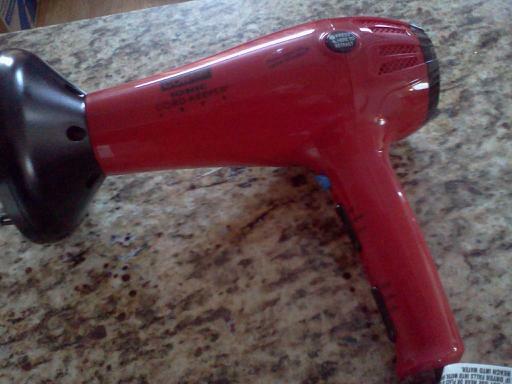 Living in the middle of nowhere, I had to drive the whole way to Philipsburg to get a hairdryer. I didn't want to go the whole way to Wal-Mart in Clearfield. At that time, $16.99 for an unplanned purchase was a BIG deal. Regardless, the Conair finished college with me and moved to Alaska a year and a half after that. Oh the sights it's seen compared to other hairdryers! Not every hairdryer gets to move so far from home. the master bathroom is awfully small. With only one sink and only enough counter space for one sink and little else. And its cord was always in the way. Often being stuffed in the cupboard by a frustrated husband who needs room to shave at 5am. And, regrettably, it took approximately 18 falls from the counter to the linoleum 4 feet below. I think it was the 18th that did it in. So it was last Saturday that the hairdryer took the 18th fall, and officially stopped working. I would say that 4 solid years of hair-drying wasn't bad for $16.99. I felt really bad throwing it away. But one of my goals in life is not to become a packrat. Especially since we are moving next week and I'm slowly becoming aware of how much STUFF we have. 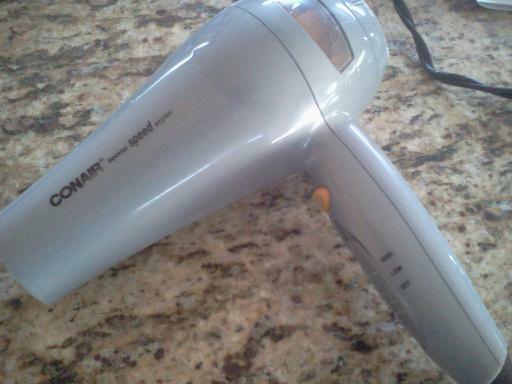 So I went to Target and bought this Conair Ionic Cord-Keeper for $23.99.